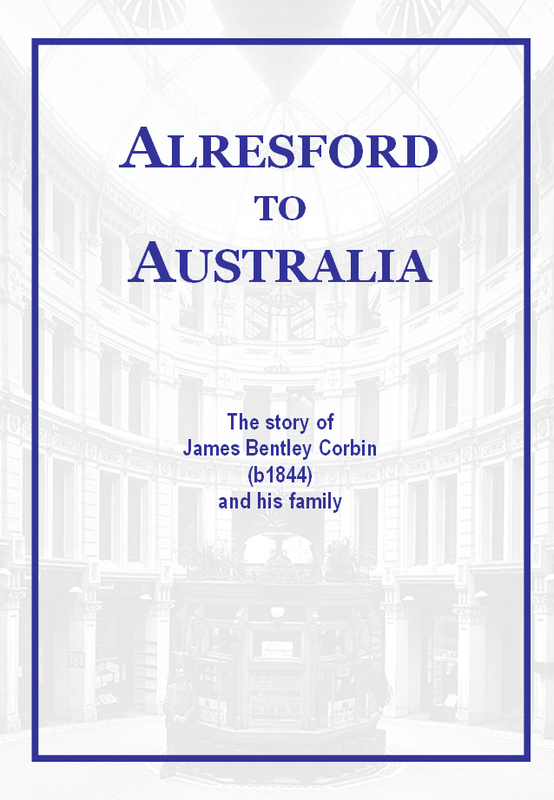 This blog/website is an exploration of Corbin family history, with a focus on the life and ancestry of James Bentley Corbin, born 1844, who emigrated from England to Australia in 1864 and settled in Sydney. He is my great grandfather. It is a fair guess that the majority of people in this country with the surname Corbin have descended either from him or from his first cousin Thomas Wilson Corbin, who established his family in South Australia. The story told in these pages (see The Story at right) was written by me for the booklet Alresford to Australia for the Corbin Gathering in 2008. The gathering was organised by the late great Ruth van Aaken and held in Canberra in March 2008 with an attendance of about 100 people. 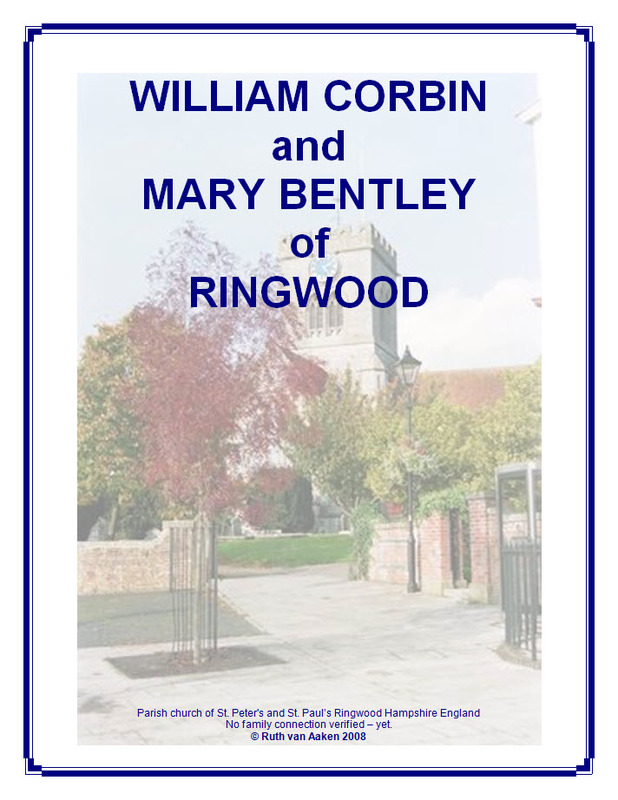 Ruth produced a companion booklet for the gathering, William Corbin and Mary Bentley of Ringwood, and I hope to be able to use content from that work to fill out the blank chapters on this site, such as English Ancestors and South Australia connection. In the process of adapting my 2008 booklet to the online format I have made some minor adjustments, but research findings since 2008 have not yet been woven into the story. It is my intention to post a series of detailed updates onto the homepage over the coming months, and to incorporate these updates into The Story itself at a later date. This site, The Corbins in Australia, has been launched to coincide with the first anniversary of the sudden passing of Ruth. Ably assisted by her son Chris, she was in the process of reconstructing her website Australian Corbin Trees when she died. More recently the site was disrupted by a computer hacker and it is currently suspended. When Chris gets it back online our two sites will complement each other. The individual stories and family trees on this site are confined to James and his immediate family, rather than more recent generations. As I see it, the early parts of the Corbin era in Australia are the parts that are common to all of us in the family, yet at the same time they are often the least well known. In any case, this blogsite is not big enough to cover extra generations. On the positive side, privacy issues and the need for passwords should not arise. A blog or weblog is a type of website to which the owner regularly posts items of interest on the homepage. It usually contains only a few other pages. Older posts are automatically archived off the homepage. A post can be indexed by adding one or more keywords to it, so that it can be easily grouped with other posts on similar topics. Why is this site a blog and not an ordinary website? Thanks to Google, a blog is cheap (free!) and simple to create and maintain compared to an ordinary website. Isn't family history a static display which won't work on a 'newsy' blogsite? No! More than ever, with so much information available online these days, family history research produces a seemingly endless series of useful 'leads' to apply your detective skills to, as you learn more and more about your ancestors and the lives they lived and the times they lived in. Much of this information is well worth sharing through the immediacy of a blog. The Society of Australian Genealogists runs a course entitled 'Blogging your Family History'. I am a South Australian Corbin from the T.W.Corbin branch of the family. 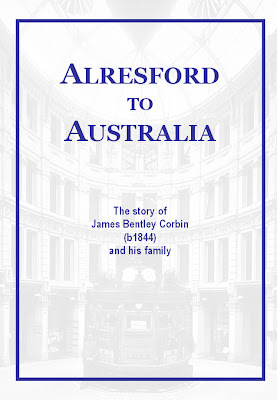 It's a bit rich, your site calling itself 'The Corbins in Australia' and then only focussing on the J.B.Corbin branch. I agree. 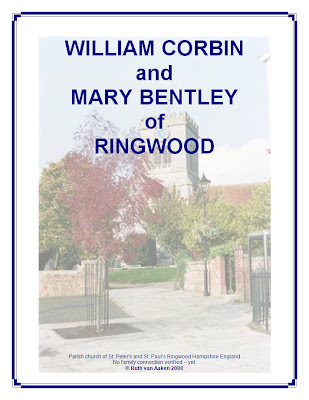 I know Ruth struggled with this too, and was working to broaden the coverage on Australian Corbin Trees by shifting the focus to our shared ancestors, William Corbin & Mary Bentley. However, expanding to include everybody will not be possible on this smaller site. My aim in the short term is to complete the chapter South Australia connection. I would love to get some feedback from our South Australian cousins. Can I contibute a story about my Corbin ancestor to your blog? Yes please. I will post the story and acknowledge your contribution. Use the contact email address at the bottom of this page. Photos, scans of documents, anecdotes, all are welcome. I think those rare stories about ancestors which convey the human side, even if the accuracy is questionable, are often more interesting than dry facts. - Ruth van Aaken - the Gathering, the website and the comprehensive sorting out of the Corbin family history that has taken place over the last few years - all this was a product of Ruth's tremendous energy and intelligence. She is badly missed. - Fr Eric Corbin - his (and my father's) interest in the Corbin story in Australia caught my attention as a child - the starting point for the story told here was Uncle Eric's 1966 'Red Book'. - Ken Harpur - for the piece about the Glebe Rd house and the Harpurs, which adds an unexpected touch to the Corbin story. - All historians, past or present, of the Corbins & related families, especially Madeleine Copping, Jim (Boyce) Corbin, Maureen Clarke. - The following organisations for photographs and documents: State Records NSW; City of Sydney Archives; State Library of NSW; National Library of Australia; National Archives of Australia. - And thank you to the many family members who have contributed photos and memories to Ruth or myself over recent years. - Statements about the number of living descendants in a branch of the family were current in the year 2008. - Variations in spellings of peoples names have been simplified to what is believed to be the correct version. - Old street numbers cannot necessarily be used to find present-day sites, as street numbering systems often changed in the early years. - Generally I have not cited my sources as it would clutter up the story. Please contact me if you wish to know my sources to enable further research. - I will gratefully receive any corrections, additional material or alternative interpretations.